Equestrian Facility in Palgrave, Ontario Canada. 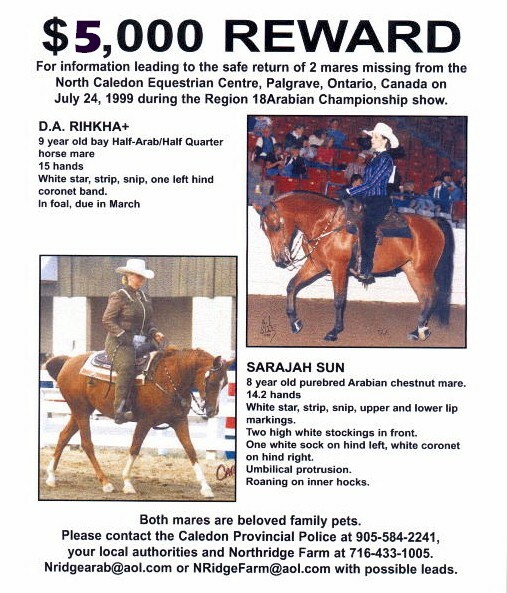 We first thought that they may have escaped, but after discovering that 2 barn halters were missing from the farm stabled one aisle over from us and that a western saddle and bridle were stolen from a tack stall around the corner from the mares, and after several volunteers searched for hours on foot and horseback, we and the Ontario Provincial Police believe they were taken. One mare had won a unanimous Championship, and the other a Reserve Championship the day before. D.A. Rihkha+ - 9 year old bay half-arab(part Quarter Horse) mare, 15 hands, white star, strip, snip, one left hind stock. In foal, due in March. Sarajah Sun - 8 year old chestnut mare. 14.2 hands, white star, strip, snip, upper and lower lip marking. Two high white stockings in front. Two white socks in back. and the stabling area was pitch black. I'd also like to add the show management was appalling unsupportive. the return of one or both of the mares.